Is it really worth the effort to have a turkey that looks like a Norman Rockwell illustration? Or could you be happy with one that cooks quickly and doesn’t need a lot of attention but is dependably juicy, tender, flavorful, and crispy-skinned? It might not win a beauty contest, but it will never be dry or chewy either. Remove giblets, neck, and liver from body and/or neck cavities of turkey. Set giblets and neck aside for making stock. (See recipe below for directions.) Refrigerate liver until needed if using for gravy. Rinse turkey and pat dry inside and out. Remove deposits of fat from body cavities and discard. Using your fingers, starting from the neck opening, loosen the skin all the way down to the thighs, being careful not to tear it. Rub turkey, with butter, inside and out, and under the loosened skin. Mix together 2 teaspoons salt, if using, and 1 teaspoon black pepper; sprinkle inside and out, including the neck cavity and under the skin. Note: do not use salt on kosher or pre-basted turkeys, as they already contain enough salt. Put onion, carrots, celery, half the apple, and thyme in body cavity. Tie drumsticks together loosely, if desired. (This is for appearance only and will make the thighs take longer to cook.) Place remaining half-apple in neck cavity, rounded- side-up. Trussing is optional. (See Tip below). Untrussed birds will cook more evenly.) Fold wings up and place wing tips under turkey. Lift turkey so juices from cavity drain into pan. Transfer turkey to a platter, tent loosely with foil, and let stand for 30 minutes. The temperature of the thigh meat should continue to rise until it reaches 175º to 180º F. Discard the apple used in the body cavity. Discard vegetables from body cavity or save for making stock (see Sidebar). Leave apple in neck cavity until ready to carve, so turkey will look plump and attractive for presentation, and then discard it. Place turkey on cutting board, carve, and serve. Recipes adapted from, Nourished; a Cookbook for Health, Weight Loss, and Metabolic Balance. Makes about 15 servings of 6 ounces each. Total weight: a 12 pound turkey yields about 6.4 pounds of cooked meat. Preparation time: 25 minutes active, 2½ to 3 hours total, not including 1 hour standing time before cooking. ~Allow at least ¾ pound raw weight per person, but 1 pound will ensure plenty of leftovers. ~Enameled, oval roasting pans with lids can be purchased inexpensively from hardware stores or supermarkets, especially around the holidays. These are the old-fashioned, speckled ones called “graniteware.” The fancy cookware stores sell stainless steel versions if you care to invest in one. 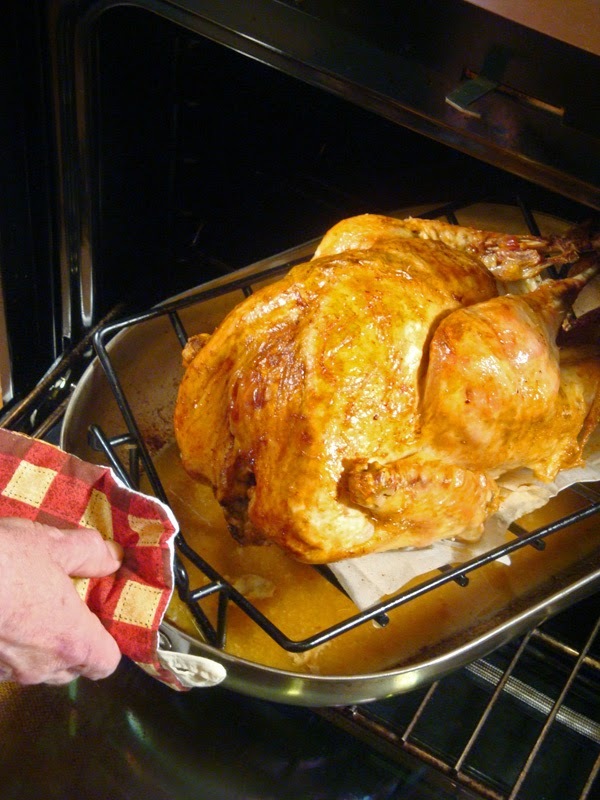 To use a regular roasting pan without a lid, cover turkey with a piece of greased parchment paper, andthen with foil. Uncover for last part of cooking time as in recipe above. A little potato flour and butter give this sauce its rich flavor and deep color. Melt the butter or bacon fat in a saucepan, add the shallot and cook on low heat until translucent. Stir in the potato flour. Gradually stir in the broth. Bring to a boil, reduce heat to low, and simmer, stirring for 2 minutes. Taste and correct the seasonings. Strain to remove the shallot. Keep hot over very low heat or in the top of a double boiler until ready to serve. Makes 1 cup or 8 servings of 2 tablespoons each. ~Potato flour turns out to be the best of the traditional thickeners for sauces. It is higher in carbohydrate than wheat flour, but you need only 1/3 the amount. It is also higher than cornstarch, but you need only half the amount, so there is still an advantage. Use 1½ teaspoons of potato flour to thicken 1 cup of liquid for a light sauce. Use more for a thicker sauce. ~The turkey will be more juicy and tender if it is cooked without the stuffing inside. Processed turkeys labeled as fresh are kept at temperatures low enough to allow the formation of ice crystals. Slight temperature fluctuations cause the ice crystals to melt and refreeze multiple times, resulting in water loss from damaged cells and yielding tough, dry meat. So unless your turkey came ] straight from the farm, frozen may be better than fresh. An “organic” label on a product guarantees that it has no additives, so organic turkeys cannot be injected with a salt and sugar solution. They must be raised on pesticide-free feed, but it can still be corn and soy rather than a natural diet of plants and insects. This affects the taste as well as the nutrition profile. If you buy a “free range” turkey, there is at least a chance that it may have eaten an occasional bug or sprig of grass. Modern turkeys are bred to have more white meat and to grow faster on less feed. The commercially grown, Broad-Breasted White is ready for market in three and a half months compared to seven or eightfor heritage varieties. This has advantages for the producers, but it makes for lean birds. Turkeys need time to develop the layer of fat that makes them tender and tasty. The turkey growers compensate by using brining solutions containing salt, sugar, oil, and phosphate. The labels say they are “pre-basted.” So an all natural turkey may not be moist. Kosher turkeys are washed multiple times with a salt solution, which has the effect of brining, making them juicy and tender without additional soaking. However, you need to allow extra time when preparing a kosher turkey to remove pinfeathers. Religious rules prohibit the use of boiling water for processing the birds. Several machines are used to remove the feathers, each with a different plucking motion, but they leave many pinfeathers behind which must be removed with tweezers or fingers. Self-basting turkeys (such as frozen Butterballs) do not need to be brined. They have been injected with a solution of salt, sugar, and chemicals to keep them moist. Brining is also unnecessary for Kosher turkeys or for any turkey roasted upside down in a covered pan. Tom turkeys are bigger, but hens have proportionally more meat. The bargain turkeys used to lure shoppers at Thanksgiving are usually Toms. I prefer an 11 to 14 pound hen—big enough to feed the family, but small enough to lift and maneuver by myself. Brown Sauce, How to choose a Turkey, Roast Turkey. Bookmark. Our Thanksgiving was complete thanks to this turkey recipe. DELICIOUS!!! Thank you!! Hi Lisa. Thanks so much for letting me know you found my info helpful! Enjoy the rest of your day (and your leftovers if there are any).